Smear enough Vaseline on the lens and the 7th best team in the EPL performed more or less to expectation last season. But viewed under natural light and in Full HD, the cracks in the foundation of Farhad Moshiri’s Everton makeover were laid bare. After a Summer of eye-wateringly expensive mediocrity, the fixture list did for Koeman before he’d even pointed Calvert-Lewin to the corner flag and told him to start chasing long balls on the first day back at training. In the first five games: Man City, Chelsea, Man Utd away, Tottenham at home. Out of the Europa League only days before suffering a 5-2 defeat at home to an Arsenal team that would go on to win only 3 points away in 2018. Already much of the squad was traipsing round the pitch with the plausible deniability of men whose manager had stopped shaving and started sleeping on a mound of bibs in his office. The ‘relegation’ word was mentioned for the first time since Rooney’s first Everton stint. And just like that, everybody lost their damn minds. Enter Sam Allardyce. It would be easy to list things that were bad about Allardyce’s tenure, and we’re going to, but one thing strikes me as unfair: while the shot differential did collapse, the style of football was really no different to anything seen under Koeman for the previous 12 months. Everton have been the longest of long-ball teams in Europe for a long time – both Koeman and Allardyce (and indeed Unsworth in his brief stint between them) were producing the longest average passes to enter the final third in the Premier League last season. Let’s not pretend Allardyce was somehow polluting Everton’s previously liquid football. Everton were 17th in expected goal difference in the league. Only two teams passed into the box less. Only three teams achieved less xG from set pieces but none of them spent £45 million on Gylfi Sigurðsson. And yet, the more things change, the more they stay the same: the team finished in the margin of error of seventh place. I don’t really believe Everton were ever at risk of relegation, or even finishing in the bottom half, so I don’t think Allardyce should be credited with a great escape given the squad he had. But Big Sam did the job, and it’s probably for the best that we all forget about it and move on. Along with Allardyce, Steve Walsh was out – neither a director of football nor a particularly good head scout – replaced by the highly-regarded Marcel Brands. This time around Everton were going to do things right, filling the vacant Director of Football role first, allowing them to lead the manager search. Finally, the team could set out a long term plan and hire a manager to fit within that – Brands spoke of wanting to exploit the academy more, alongside hints from Moshiri that he might end his debauchery in the transfer market. If Everton wanted to be more moderate in the transfer market, it’s a shame Brands didn’t have the time to watch any Eredivisie games during his stint as — *checks notes* — Sporting Director of PSV Eindhoven, otherwise he might have cast an eye over top-scorer Alireza Jahanbakhsh before his £17 million move to Brighton. As it was, Brands flexed his newfound authority and hired the guy Moshiri told him to, Marco Silva, and then splurged £40 million on Silva’s favourite player from his former club. Now, it’s not for me to say that Everton went and hired another Director of Football and forgot to give them any actual responsibilities or authority again, but it sure seems like that’s what happened. Despite winning his first game in charge 22-0, it would be easy to write off Silva as a relegated EPL manager with a big philosophy in the style of third-best-manager-at-the-World-Cup Roberto Martinez. But after two seasons of Koeman and Allardyce’s hoofball, Silva is a step forwards, if not the return to the school of science some might desire. There’s been a hole in the centre of the field for Everton for the last couple of years – there are no passing central midfielders and the workaround to date has been long balls into the final third. Silva isn’t going to completely fill this hole with scintillating passing moves through the middle. We can expect fewer long balls (as long as the players don’t revert to type), but in pre-season and Silva’s previous teams, he’s looked to progress the ball out wide. In defence, this has revealed (most notably against Rennes) the other hole in the team – when Everton face counters down the flank, rightback Seamus Coleman is ahead of the ball, midfielder Idrissa Gueye is off like a headless chicken as usual, and his partner Morgan Schneiderlin isn’t overly bothered about filling in. 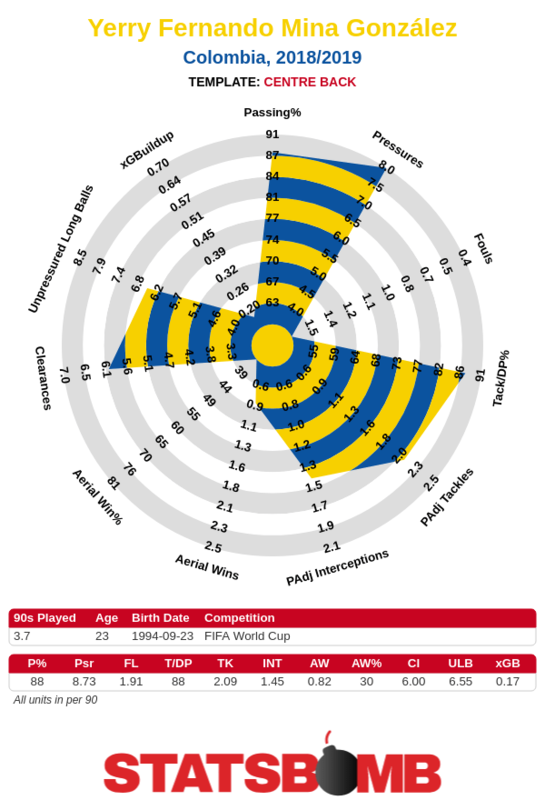 Against the likes of Phil Jagielka, it feels like we’ll see balls flashing across the face of goal on the break pretty regularly, although late transfer window addition Yerry Mina may be the front-foot kind of defender we need in these situations. In attack, Silva’s teams have often been some of the crossiest in their leagues: while at Sporting, more than 60% of his team’s box entries were via crosses. For all his plucky-underdog performances at Estoril, Hull and Watford, Silva is going to be facing more deep blocks in the EPL with Everton. I’m not inspired by the thought of watching crosses getting knocked into a crowded box over and over again, followed up by Gylfi with the worst completion rate on corner deliveries of any player taking 50 or more the EPL last year. The hope therefore is that a fit Theo Walcott, who looked very lively on his return from an ankle injury against Valencia, and record-signing Richarlison can do some magic to unlock things. 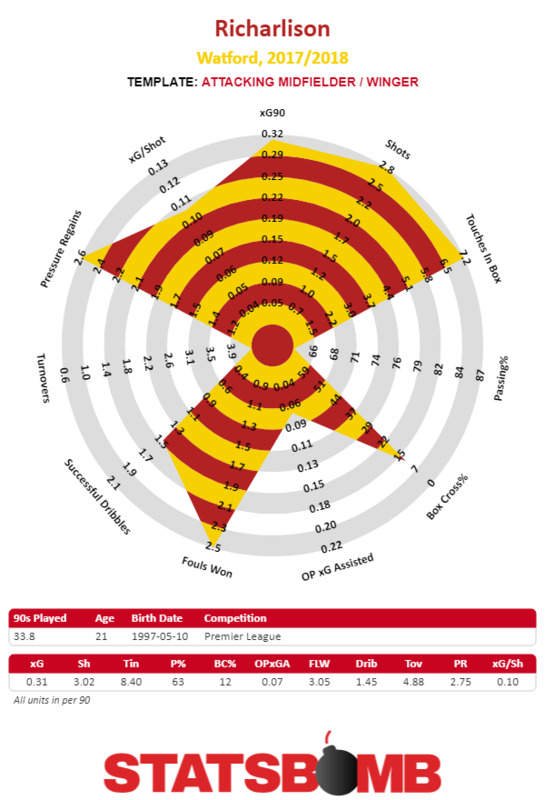 Right-footed left-winger Richarlison should indeed offer a different avenue of attack – he doesn’t really have much in the way of passing numbers at all, but he’s busy, combative and pacy. Nicking balls all over the pitch and bursting from deep, only Jack Wilshere and Eden Hazard were fouled more than the young Brazilian last season. In the final third, he almost profiles like a wider, less creative Dele Alli, finding the right positions outside the box to make dangerous runs towards goal. I’m intrigued how it’ll work out – in his first couple of pre-season games you can often see him crowding the spaces Cenk Tosun already occupies, but it’s early days. With the majority declining (and some with not much declining left to do before they hit the rocks), none of the youth has really set the world alight. Tom Davies – the Scouse Hector Bellerin – runs a lot but produces little. Calvert-Lewin showed brief glimpses of talent while being given some of the most thankless tasks in the squad. Only Ademola Lookman felt genuinely exciting, but the rumours of a permanent move to Leipzig persist. Losing him would feel like a failure of either the new regime’s ambition or ability to inspire, but it’s possible that he, like me, just wants to inhabit the alternate Rangnickverse where Everton hired him and not Martinez in 2013. Elsewere in transferville, Everton solved the Leighton Baines succession problem with the once-promising and now actually 25 Lucas Digne. Baines has been a tremendous servant to the club through the not-quite-golden-era-but-you’d-probably-have-it-back Moyes period and beyond. Nobody in the Premier League has been a more reliable crosser into the box over the years, but Baines’ game has been by no means old-fashioned. Before Everton had billionaires in charge, I often felt that the team should have cashed in on him, and in his 11 years at the club the academy has tried and tried and tried again to dethrone him: Patrick Boyle, Jake Bidwell, Brandan Galloway, Luke Garbutt, even Jonjoe Kenny, Harry Charsley and Tyias Browning a couple of times. But like Baines himself – several times voted Most Likely To Retire And Become An A&R Man For A Small Indie Label You Probably Haven’t Heard Of by his teammates – the traditional warmer sound of vinyl always prevailed over these new fangled options. Whether Digne is first choice immediately is unclear, but if he can’t budge 33-year-old Baines then he truly has squandered the brief glimpses of talent he has showed over the years from a succession of Champions League benches. So, whither seventh? This season’s outlook comes down to whether you believe there’s enough latent quality and potential in the existing squad to guarantee the top half. Last season descended into panic, when patience and optimism were needed – Everton are still building a stadium, still financially secure, and in the wake of Stan Kroenke’s buyout at Arsenal it’s possible that the power behind the throne could be even more willing to push on. It all leaves Everton still up around the ceiling of squad quality outside the European places, and betting markets seem to agree. But it’s fair to say our skies are increasingly crowded, and there’s smart recruitment going on all over the place. 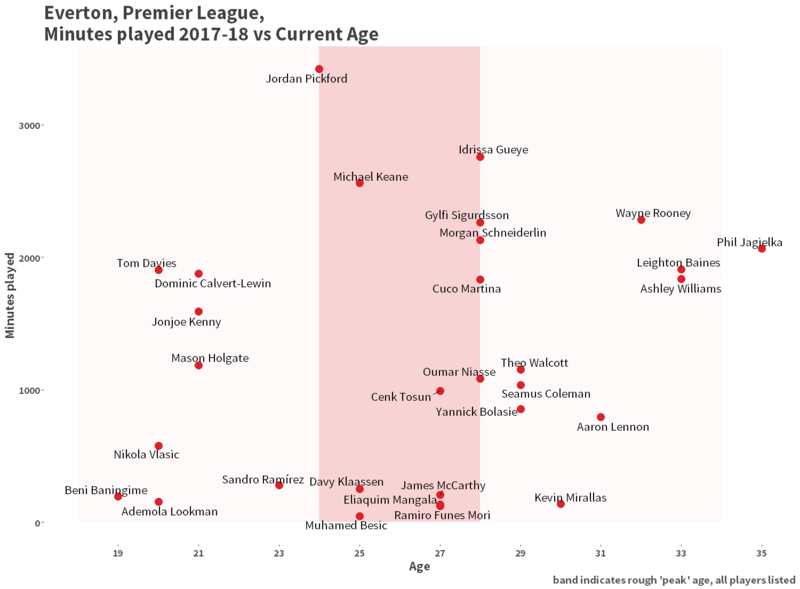 I suspect the floor of quality in the league is higher this season as well, outside of Cardiff – although even then, Championship deep blocks and long balls haven’t performed the worst in the last couple of seasons with everybody believing they can press way up the pitch. It’s hard for me to believe that losing Lukaku and adding a year to the legs of the likes of Jagielka sent the squad from 7th to 17th best team in England last season. And so this season demands something of an act of faith: to ignore last year’s numbers for intangible reasons, and to believe that now a young, long-term manager can give the club the sense of progress that’s been lacking since Martinez’s first tilt at the top 4. It’s a lot to ask of Silva and of fans’ credulity. But, after enduring Allardyce, asking for hope, even irrational hope, seems like a step in the right direction.